On the heels of EDC's 2017 U.K. trade mission, San Diego-based Edico Genome and Genomics England announced a new partnership to strengthen the accuracy and consistency of next-generation sequencing (NGS) data analysis in Genomics England’s Rare Disease Pilot. The partnership will support Genomics England in making NGS the standard of care across the U.K.’s National Health Service in 2018. Specifically, the partnership will focus on the analysis pipeline − improving alignment and variant calling of whole-genome sequencing data. 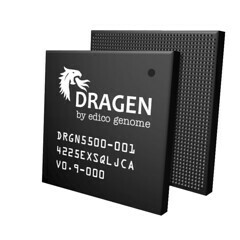 Genomics England selected DRAGEN for its industry leading accuracy and speed, enabling the organization to accelerate analysis of large clinical genomic datasets. Read more from Edico Genome. EDC is proud to take part in the BIO International Convention, the largest life sciences convention in the world, hosted right here in San Diego from June 19-22. 5:00 - 7:00pm: San Diego Innovation Council Reception. Register here. *must be registered for BIO to attend. When MIT set out to the name the world’s smartest company in February, they didn’t look to count the number of patents or PHds or even stock gains; instead, they asked themselves whether a company had made strides which have helped redefine its field. The answer was not a company located in Silicon Valley or Seoul or London. The answer was – and still is – right here in San Diego. That company is Illumina. Founded in 1998, Illumina has not only helped build the genomics field, but also has redefined it. In a time when medicine and medical research are becoming increasingly expensive, Illumina has made personalized medicine more attainable. They have made it feasible to sequence genomes for under $1,000 a patient. Last week, more than 15 EDC stakeholders got to experience this innovation first hand when they toured Illumina’s UTC headquarters. With its wide array of platforms, Illumina is sought out by researchers and healthcare professionals as well as ancestry companies, such as Ancestry.com and 23 & Me to provide valuable genetic information. Each day, Illumina and its 3,000 global employees- 1,500 in San Diego - work to improve lives around the world by unlocking the power of the genome. On the tour of Illumina’s campus, guides walked participants through R&D space, on-site manufacturing facilities and a suite of amenities available to Illumina’s employees, including a state-of-the-art fitness center, coffee shops, an amphitheater and the cafeteria, which employees admit is the most effective and efficient meeting space on campus. Collaboration is at Illumina’s core and all of these spaces provide opportunities for employees to exchange information and generate new ideas, developing the next ideas that will fuel Illumina’s growth as a global brand. As MIT notes when talking about their rankings, “It might sound difficult to define what makes a smart company, but you know one when you see it.” Thanks in part to Illumina, San Diego is showing the rest of the world what smart really means.